“Faith in God is huge for us,” stated Dawn Chambers about her son Jyriaun. Jyriaun contracted a tumor in the cerebellum when he was only nine months old. 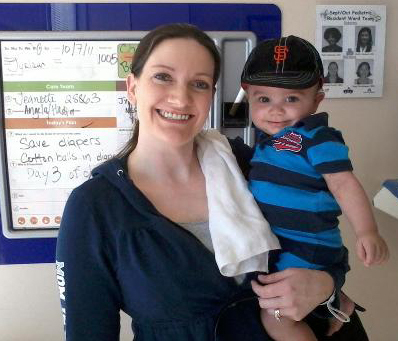 Dawn, who works in the music department at Delta College gave birth to her little boy Nov. 27, 2010. The first months of her son’s life were full of joy and laughter. But on Aug. 31, 2011, Dawn and her husband Jagada noticed their son was struggling to stand and could not sit up like he previously had done. They took him to the Stockton Kaiser facility. By the end of the day doctors confirmed their worst fear — Jyriaun had a tumor that was blocking the backside of his brain. The couple immediately rushed their son to a specialty medical facility in Oakland on Sept. 1, 2011. He had surgery in the wee hours of the morning. During the surgery, the doctor’s cut pieces of the tumor off and sent it to the lab. To the couple’s dismay, the tumor was confirmed cancerous. Little Jyriaun went through chemotherapy. One week in the hospital, three weeks at home. This process continued from October through March of this year. Dawn said that Jyriaun’s doctor was extremely well known and that they automatically clicked. Dawn knew her son was in good hands. Jyriaun’s completion of chemotherapy left his parents frightful. The doctor said he might lose his hearing and his motor development skills could be at risk. Jyriaun’s path to recovery has been long and strenuous. For the next few years, it is recommended by doctors that he get checkups every three months. Miraculously, he is not taking any medication. Dawn said her family has a great support system, including her fellow employees, family and friends through Facebook. “I don’t know if I would be able to get through it by myself,” she said. Dawn describes her son as running the show, adorable, having a good spirit and really special.